Apart from eating, I also did some amazing shopping in Mumbai and in Delhi. I wasn’t able to take pictures of everything I bought, but here’s a sample of some fabrics I picked up for my home. All of them are from an amazing store I have been in love with for years, called FabIndia. Aren’t they pretty? 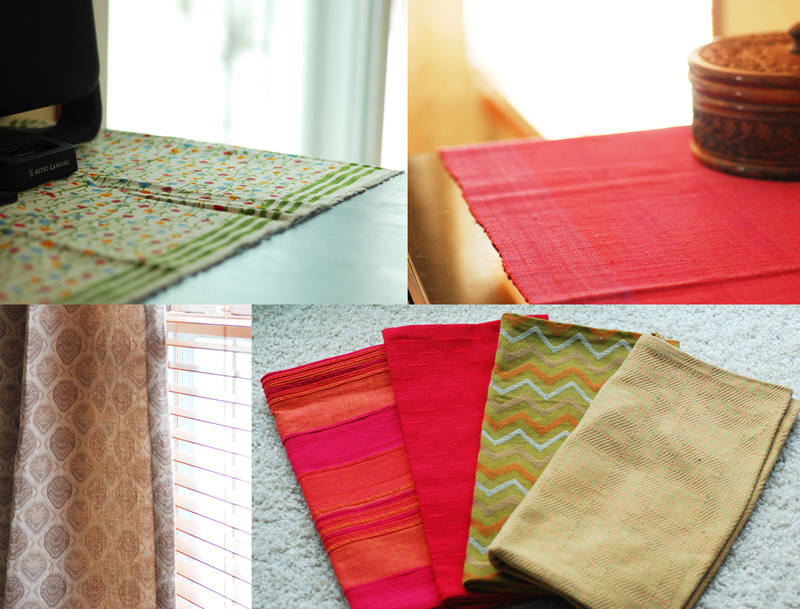 Despite the jetlag, I eagerly put up all the new table runners, cushion covers and curtains I bought all over my home. It feels so wonderful to make my home look a little more ‘Indian’ 🙂 I also picked up some pretty leather slippers, lots of cotton tunics from my favorite Indo-western clothing store W, and lots of other trinkets for the home and my jewelery box. In all my greedy, irresponsible shoveling-of-food-in-the-mouth and indulgent shopping, I never, for a moment forgot you. I got an amazing stash of home made spices and spice mixes with me that my mother uses pretty regularly and I have tried myself as well. I’m a big lover of spice mixes once in a while when I want to make something special and I scouted around for good spice mixes when I was home. Below are 5 I brought along. And the best part is – I’m giving it all away! 1. Home-made Garam Masala – This is the best part of my spice stash – the star of Indian cooking. Made using authentic Indian spices such as cloves, cumin seeds, bay leaves, cinnamon and peppercorn, Garam Masala has many uses in Indian cooking. 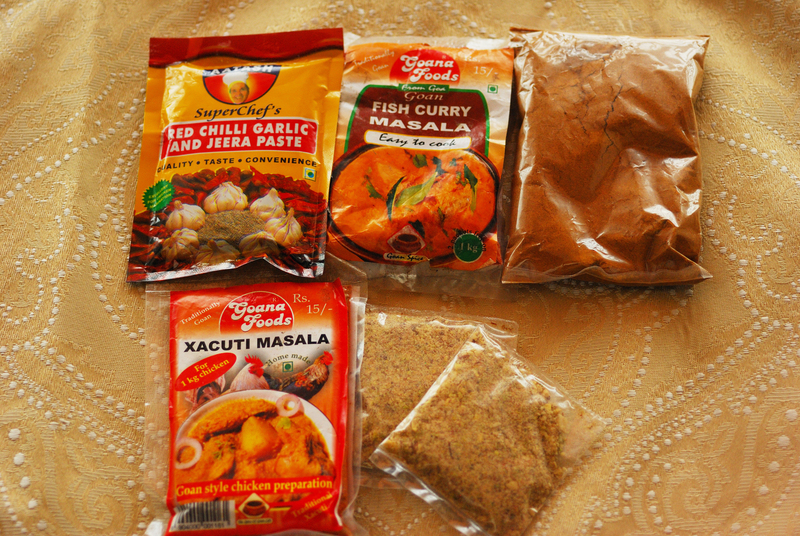 Search for Garam Masala on my blog and you’ll get a list of recipes you can use it in. Manufactured by Royal spices in Mumbai. 2. Ready-made curry paste (Red Chilli Garlic & Jeera (cumin) paste) – My mother uses this paste to whip up quick curries and marinades when she’s pressed for time. It is pre-packaged and manufactured by Aatash foods in India and is purely vegetarian. You can read more about the paste and how to use it here. 3. Home made Milk Masala (the 2 small packets above) – This is a widely used spice mix in India and is added to warm milk to form a fragrant, rich drink. Made using almonds, cashews and cardamom, this makes the ideal, healthful drink for our cold Midwestern winters. Milk masala can also be used in ice creams and rice puddings. The following 2 spice mixes, although made for non-vegetarian dishes, can also be used to make vegetarian dishes as the spice mixes are 100% vegetarian. 4. Goan Fish Curry Masala – This masala can be used to make an authentic Goan Fish curry. Goan food is a unique Indian cuisine that involves the usage of coconut and tamarind among other local ingredients. Most of their dishes are made using seafood and this masala will give you the authentic Goan fish curry flavor. Manufactured by Goana foods. 5. Xacuti Curry Masala – I wrote about this poultry based Goan curry in my Iron Chef post. This is a rich Goan curry made on special occasions. Also manufactured by Goana foods. So here’s how you can win! A comment on this post qualifies you to enter but I’d also love any suggestions you may have for my blog. Are there any specific Indian recipes you’ve been looking for and can’t find on the web? Do you want me to share more info on a particular Indian ingredient? Shout it out! Comments will close on Sunday Jan 30th at 10 AM Central US time. The giveaway is only open to US residents. The winners will have a week to send me a US address so that I can mail out the spices. Legal Disclaimer: While all the spices do not contain egg, peanuts, tree nuts, fish, wheat or dairy products, they may have been prepared in a kitchen where these products are used. Please do not participate in this giveaway if you may be allergic to any of these ingredients. FTC Disclosure: I received no fees for hosting this giveaway. I will provide the winner with the prize free of charge. I do not endorse the companies mentioned above. Thank you so much for giving me the chance to learn AND also to win! I have just discovered your blog and am so excited to spend more time checking it out! I love India and Indian food and want to learn more recipes and cooking techniques. I spent a semester studying in India, spent most of my time in Tamil Nadu but also traveled throughout the country. Last year I visited Mumbai with my husband and we ate, and ate, and ate. I would LOVE to cook with your spices! And your textiles are beautiful! Awesome giveaway, thanks!!! I’ve shopped in FabIndia via online before and loved the site…. I have to admit, I’m a new reader but I love your blog. the recipes always look delish, and I especially thought the post on the jugu cake was great. I think that a cool post would be something like, how to plan the perfect indian themed dinner party. My friends and I do theme dinner parties each month and, despite the fact that none of us know how to cook a LICK of indian food, I suggested that as the theme for march. I just stumbled upon your blog while googling kari-chawal and man did I hit the jackpot! I love that you have the recipes for food that I grew up eating but never bothered to learn to cook. I did have a suggestion though; I couldn’t find a summarized content section on the blog? (could be because I’m a newbie and haven’t figured it out as yet) I think it’s sorted by category right now (appetizers, entrees etc) but it would be easier to browse through the recipes when you aren’t looking for anything specific. What about the classic chicken tikka masala? Wow, what an amazing giveaway! I’m new to your blog, so I have no suggestions for you 🙂 but will be spending many hours looking through your recipes. I’d love a great tutorial on how to make rice like you get at Indian restaurants! It’s long and yellow and nice and fluffy! Looks like you had an awesome trip. I am jealous 🙂 I am new to your blog and haven’t had a chance to look through the recipes. I would love a good Dal Shorba soup recipe if there isn’t one.